The heavens will be putting on a big show as Thursday night becomes Friday morning. If you find yourself outside during the night Thursday, don’t forget to look up. Meteors are chunks of interplanetary material that typically burn up when they come into contact with our atmosphere. We call them meteoroids when they’re floating in space. They’re meteorites once they land on the ground, as many thousands do every year. And when Earth’s orbit takes it through the debris field of a comet orbiting near the Sun, we witness a meteor shower. The Perseids typically peak in mid-August every year, when the Earth intersects with the trail of Comet Swift-Tuttle. Debris from the comet impacts the Earth’s atmosphere and streaks across the sky, creating shooting stars…. 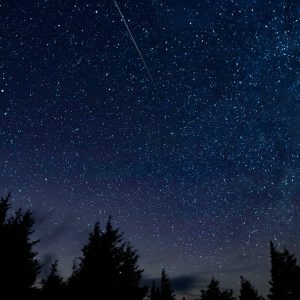 There’s a helpful NASA site that can help you get the most out of this summer’s Perseid shower show. Unfortunately, not everyone can see meteor showers or other heavenly glories. Some of us who live in big cities are blinded by our own light: we’re unable to see into space because we’ve let there be too much light on Earth. This can Dark Site Finder can help you locate the nearest dark spot. In 1908, the Tunguska meteor was traveling toward Earth at 40,000 mph when it exploded far above our planet’s surface. The blast’s force knocked down an estimated 80 million trees across some 800 square miles, instantly turning forests of tall timber into trillions of toothpicks. A 150-foot-wide meteor struck Arizona some 50,000 years ago, unleashing the explosive force of 20 million tons of TNT…. Mining entrepreneur Daniel Barringer bought the crater in 1903, hoping to get rich mining its awesome ore. But he never found his mother lode. Where did Barringer’s meteor and all its supposed mineral wealth go? 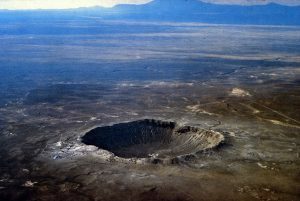 Scientists say that when the meteor collided withg the desert, the meteor vaporized upon impact, spreading tiny specks of molten metal across the desert for miles around. Today, Barringer’s descendants still own the crater, and the Barringer Crater Company welcomes thousands of paying guests to view exhibits at a nearby visitor’s center and take brief tours along part of the crater rim. During tours, guides show guests where the remains of Barringer’s meteor went, sticking a small magnetic rod into the soil and holding it up for all to see the tiny specks of metal clinging to the magnet. The heavens declare the glory of God; the skies proclaim the work of his hands (Ps. 19:1). Catch the Perseid meteor shower to see that glory vividly declared and proclaimed! You can read all about meteors and other mind-blowing cosmic characters in Star Struck: Seeing the Creator in the Wonders of Our Cosmos, written by yours truly and astronomer David Bradstreet (Zondervan, Sept. 2016).